Early in 1992 I arrived back in Bondi after spending 3 months holidaying and working in Thailand. When I returned to Sydney, it was difficult to find work. I’d been a bit of a bedroom musician…played keyboards/piano, had jammed with friends and had dabbled in songwriting. 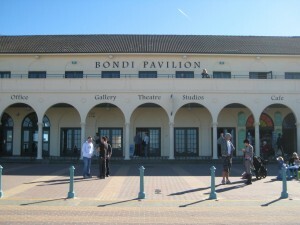 Then a friend of a friend told me about the Bondi Wave Music Course, which is held at the Bondi Pavilion every year. The Course sounded awesome so I applied for it and got in. The Bondi Wave Music Course provides young musicians with intensive training in all aspects of music and working in a band – singing, theory, percussion, business skills, etc. So over the autumn-winter months of 1992, spent 5 full days a week living, breathing and practically eating music with the other “Wavers” at the Pav. It was one of the most creatively satisfying few months of my life, being taught by a diverse range of outstanding and inspiring musos. In the early days of the course, the uprising of anti-democracy protests in Thailand became headline news here in Sydney. Thai people were protesting in Bangkok against the government of General Suchinda Kraprayoon (a non-democratic regime), demanding Democracy. The military response resulted in over 50 confirmed deaths and hundreds of injuries. One of the hotels that I’d stayed in while I was in Bangkok became a makeshift hospital for the injured and nearby, the Democracy Monument on boulevard Thanon Ratchadamnoen Klang was where many of the protestors were killed, since this was where they gathered to give voice to their pleas for Democracy. This calamity became known as Black May in Thailand. I was pretty upset by what was happening in Thailand and at the same time was getting into songwriting from doing the Wave. So I ended up writing a song called The Monument and we publicly performed it on stage in the Pav at in the end of course show. In the last few days the news of protests in Bangkok again has and the injuries and deaths that have resulted from the military crackdown have jogged this Bondi Wave memory for me. Is it a coincidence that the Black May event of 17th – 20th May 1992, happened exactly 18 years ago? Is this now Black May #2? So I’ve decided to dig out the original recording of The Monument and put it up here in memory of all the Thai people who have died or who have been injured protesting for democracy in Bangkok, both in these past few days and during Black May 1992. Hope you enjoy it. The Monument is a fantastic song Bondimermaid! Would love to read the lyrics as I couldn’t make all of them out. Interesting and thought provoking blog too. I lived in North Bondi in the 80s and witnessed The Saints playing at The Astra. I was very sad to see The Astra go, even though it was obvious that the drug scene there was out of control. There goes another piece of history. The recording of The Monument that I’ve uploaded here is an original recording which I only had on cassette. So unfortunately the quality is a little poor, thus maybe a bit tricky to hear all the words. I thought that most of the lyrics were clear…perhaps you’re unsure of the lyric that says “down to Ratchadamnoen” ? I remember grooving down to your funky sounds sister! Yeah it was pretty special hanging out at Bondi every day in winter, making music! By the way B-Mer, why is there no video of you playing that song??? I don’t know where the VHS tape is. Nice blog! I have such strong feelings about Bondi even though I grew up in Vaucluse. My Dad used to play cards in the pavilion there. So many memories of my childhood/teenage years. Its weird because I’ve spent almost as much time away from Sydney as I did in Sydney! I still get this feeling inside me when I’m there – it sort of takes my breath away sometimes. Its so hard to explain and I can’t understand why I have such a strong connection – my family are no longer there. But I’d rather be there than anywhere else its weird. Thanks for your thoughts Netsky. 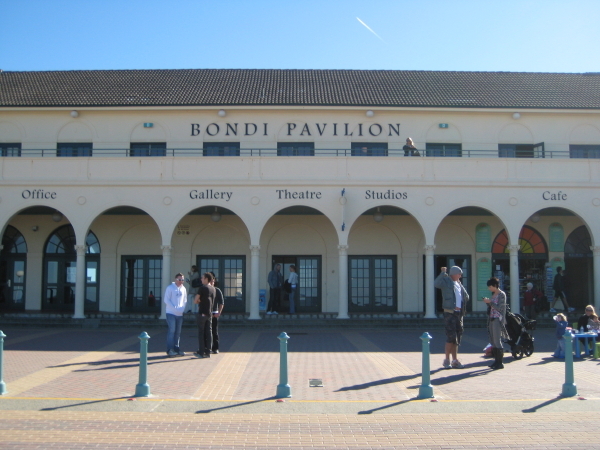 The image of men playing cards in the pavilion is a strong Bondi image/memory for me. They are still there some days. On my “About” page I have included a photo of this. Yes, I understand how even though your address may not have been “Bondi,” if you grew up in the Eastern Suburbs/Bondi area, Bondi Beach played a big part of childhood and teenage years. That feeling you mention – I get it. I know we’re not alone. Thank you for your comment and also for educating me. I just discovered who Grace Slick is. Of course I knew the song White Rabbit. I admit to loving a lot of female singers from the1960s and the folk and psychadelic stuff. So i will gladly take your comment as a lovely compliment, but just curious, was it the singer’s voice in The Monument that reminded you of Grace Slick, or was it the song itself?